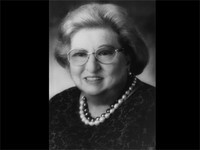 Mar 12, 2008 — Yeshiva University deeply mourns the loss of Erica Jesselson, a benefactor of Yeshiva University and a woman of rare, indomitable spirit who devoted her long life to philanthropy, the arts, and Jewish education. Mrs. Jesselson was 86 and died of natural causes on March 12, 2008 at her home in Riverdale, New York. A celebrated patron of the arts, Mrs. Jesselson was the driving force and inspiration behind the establishment of the Yeshiva University Museum. She and her late husband, Ludwig, founded and endowed the museum and she served as the chair of the board of the Yeshiva University Museum from 1973 until her death. Born Erica Pappenheim in Vienna in 1922, when World War II broke out Mrs. Jesselson and her younger sister, Lucy Lang, were sent to England on the Kindertransport. The sisters were reunited with their family in 1940, when the Pappenheims moved to Brooklyn, New York. Mrs. Jesselson and her sister, who became a prominent businesswoman and, later, the treasurer of the Friends of the Yeshiva University Museum, were never separated. Mrs. Jesselson was married to Ludwig Jesselson, a legend in the commodities and trading community, and they made their home in the Riverdale section of the Bronx, and in Jerusalem. Mr. Jesselson was a stalwart fixture of the university, where he served as chairman of the board of trustees from 1989 until he died in 1993, as treasurer from 1977 to 1989, and as a board member for more than 30 years, from 1961 until his death. Together, the Jesselsons made an indelible mark on the Jewish community and the arts and culture of America and Israel through decades of benefactions. They financed a synagogue at the Haifa Technion (where both served as board members), founded a religious school for girls in Jerusalem, endowed a program for rabbinic scholarship at Bar-Ilan University, and helped plan and build Shaare Zedek hospital in Jerusalem, where Mrs. Jesselson served as national president of the American Friends of Shaare Zedek Hospital. The Jesselsons endowed a chair of mathematics at The Hebrew University, and spearheaded a revival of The Hebrew University’s National Library; both Mrs. Jesselson and her husband received honorary doctorates from the university. Mrs. Jesselson served on the International Board of Bar-Ilan University. She and Ludwig Jesselson were major benefactors of the Israel Museum and the Israel Philharmonic Orchestra; Mrs. Jesselson served on the boards of these institutions. In the United States, through the Jesselson Foundation, Mrs. Jesselson supported numerous organizations, including the Riverdale Jewish Center, and the SAR Academy and High School in Riverdale. She served on the boards of the UJA Federation of New York and Gesher. She was also vice chairman of the Center for Jewish History and a co-founder of PEJE (Partnership in Excellence in Jewish Education). The Jesselons’ involvement often went beyond philanthropy. Ludwig Jesselson—a devoted bibliophile—was instrumental in the formation of the Judaica Conservancy Foundation in the mid-1980s. The foundation, an organization which apportioned Jewish manuscripts and artworks that were displaced during World War II, divided the remaining rare treasures among major Jewish cultural institutions and is charged with their preservation. The couple’s generosity to Yeshiva University and its numerous schools was extraordinary. They provided key support for the university’s undergraduates through gifts to scholarships and Jewish education. They were renowned collectors and connoisseurs of Judaica and Hebraica; through gifts from the Jesselsons and the Jesselson Family Trust, YU was able to acquire a number of rare materials (including Judaica Americana), publish a catalog of its incunabula, and make its Judaica collections more accessible to students and scholars. The support and patronage of Mrs. Jesselson were crucial not only for the Yeshiva University’s museum but also its libraries; her gifts made possible key technological enhancements during the 1990s, as well as the development of the Yeshiva University Archives. In 1983, Mrs. Jesselson was presented with the Distinguished Service Award at Yeshiva University’s 59th Annual Hanukkah Dinner and Convocation, and for the last decade of her life was chairperson of this, the university’s premier fundraising event. At the May 1998 commencement, she received an honorary degree of Doctor of Humane Letters. The Jesselson family remained close to Yeshiva University for more than four decades. To honor her husband’s memory, Mrs. Jesselson joined with other family members to establish the Ludwig Jesselson Kollel Chaverim (Institute of Advanced Talmudic Study) at YU’s affiliated Rabbi Isaac Elchanan Theological Seminary. Mrs. Jesselson was presented with the Eitz Chaim (Tree of Life) Award, the highest honor conferred by RIETS. Mrs. Jesselson is survived by three sons: Michael (married to Linda), Daniel (married to Yael), both residents of New York, and Benjamin (married to Phyllis), who lives in Israel, and by numerous grandchildren and great-grandchildren as well as her sister, Lucy Lang. Michael Jesselson has served on the Yeshiva University board of trustees since 1993, and was awarded an honorary doctoral degree in 2002. He is a member of the boards of the Einstein College of Medicine, the Rabbi Isaac Elchanan Theological Seminary, and the Yeshiva University’s high schools.